Posted May 2nd, 2018 and filed under Legal Issues in Spain, Motoring in Spain, Newsletters. Do you know all the rules in Spain about safety belts in cars, motorbikes etc.? The N332 Group of Guardia Civil officers have been translating Spanish law to help us learn the rules, and here is some of the information. 1. Drivers and occupants of motor vehicles and mopeds are obliged to use a safety belt, helmet and other protective elements. 2. Breaking the rules for the use of safety belts, and other mandatory safety devices are considered serious, as in article 65.4.h) of the Spanish Law on traffic, motor vehicle traffic and road safety. Drivers and passengers of vehicles are obliged to use, correctly fastened, approved safety belts. This is not an obligation in vehicles that do not have them installed. One of the most common infractions is by passengers in the back seats not using their seatbelts. Often through laziness, or a false feeling of security. If a vehicle has safety belts, these must be used by all its occupants. Failure to use seatbelts by back seat passengers can result in serious injury to both the person not using the seatbelt and those in the front seats. 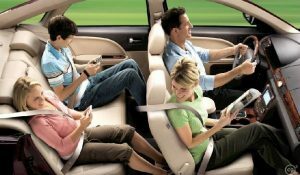 When we drive with children in the back seats we should, of course, check that they are using the seatbelt properly, otherwise, it could cause injuries, even including being thrown out of the vehicle. Remember that wearing a jacket or coat reduces safety belt effectiveness if there is an accident. This is not a punishable offence, but it is advisable not to wear thick jackets or similar while driving. It is common sense really. Some people after buckling their belts put them under their arm to be more comfortable, but remember that failure to use a seat belt properly is a serious offence and can cause a worse injury in an accident. For vehicles that, due to their age, do not have belts installed in the back seats, then the owner/passengers cannot be required to use a belt, nor to install them. However, if someone has a vintage car and decides to install them voluntarily, then belts should be used if they have been put in. It has been an obligation to install rear seat belts in the back of all newly registered vehicles since June 1992. Children equal to or less than 135 centimetres must use child restraint systems. 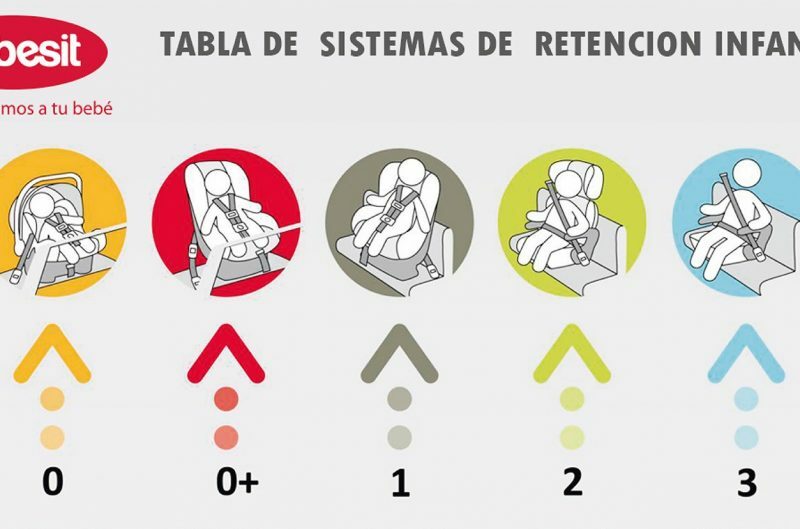 Spanish traffic legislation does not dictate the use of child restraint systems (such as booster seats) now depending on the age of the child but on their weight. Please see the diagram above. 1: 9 months – 4 years – weight between 9 & 18Kg. Child must be in backseat facing forwards. 2: 4-6 years – weight between 15 and 25kg. Child must be in backseat facing forwards. 3: 6 – 11years – weight between 22 and 36kg. Child must be in backseat facing forwards. Should I place the car seat facing forward or backward? The Traffic Department advises that when the seats of groups 0 and 0+ are used (up to 13kgs), the seat should be placed facing backwards. It has been proven that in the case of an accident, it reduces the risk of serious injuries to the neck. At early ages, babies do not have very developed muscles in the cervical area, so in the event of an accident, it could cause very serious injuries and even death. The limit of when to stop putting children in the seat facing backwards (between 0+ and 1 above) needs to be decided by the parents, or by the height of the child, since it is not advisable that the child’s feet are that long that they are resting up the back of the back seat because it could cause leg injuries in case of an accident. If the police see children being transported under 135cm not using the correct approved restraint systems or in a front seat , they will stop the vehicle and they will not be able to continue until there is a child restraint system or the child is in the correct position/place. 1. When the vehicle does not have back seats. 2. When all the back seats are already occupied by minors. 3. When it is not possible to install all the child restraint systems in the aforementioned seats. If the front seats are occupied and the vehicle has a front airbag, only rear-facing restraint systems can be used if the airbag has been deactivated. Remember that carrying a child of 135cm (or less) sitting in the front when none of the exceptions is the case will be considered a serious infraction. 4. Child restraint systems should always be installed in the vehicle in accordance with the instructions provided by the manufacturer. if you do not make proper use of these security systems, they lose their effectiveness. This certificate must be presented when requested by a traffic officer. Any certificate of this type issued by the competent authority of a Member State of the European Union will be valid in Spain accompanied by its official translation. One of the most common mistakes when travelling through Spain with a medical certificate that exempts from the use of a belt or helmet for medical reasons, is that this document was written in another language and not translated into Spanish, so that when the police stop the vehicle, it is not accepted as valid, and they are fined. Please remember that to be valid the certificate must be issued by a doctor and be translated into Spanish. In Spain, there are no exemptions of a religious nature to not use a helmet, so if you are going to ride a motorcycle you should always make use it. • a) Taxi drivers when they are on duty. When they drive in urban traffic, they can transport children whose height does not reach 135 centimetres without using an approved restraint device adapted to their size and weight, as long as they occupy a rear seat. • b) Merchandise distributors, when carrying out loading and unloading merchandise in places located at a short distance from each other. • c) People who accompany a student during driving lessons and are in charge of the additional controls of the car. 3. Persons with a certificate of exemption for serious medical reasons.